One year old plants which started from hapas. 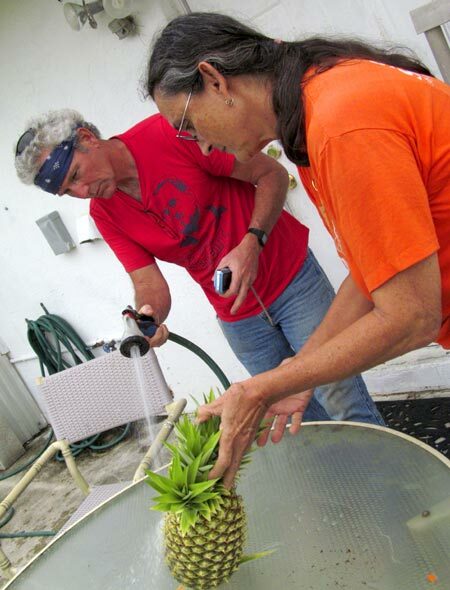 Recently, farmer Margie and I were invited over to The Lettuce Farm to pick some pineapples. Really! Farmer Tim Rowan has all kinds of fruit growing during the summer, when it’s too hot for lettuce and cabbage. Whenever you visit a farm for the first time, the farmer will take you on a tour of all the significant plants and features of his or her place. Tim pointed out Tommy Atkins mango trees loaded with blushing round-shouldered fruit, ribbon-like dragon fruit cactus vines ready to bloom and complete with an abandoned bird’s nest, passion fruit vines thick on a trellis, and quite possibly the area’s largest compost pile running the length of his property. The field where he grows lettuces and cabbages in winter was covered densely with elephant grass as tall as our heads, and home to twittering birds. Farmer Margie learns the fine art of picking pineapple. But what drew our attention and curiosity were the large raised beds, loaded with pineapple plants, which ring his modest house. 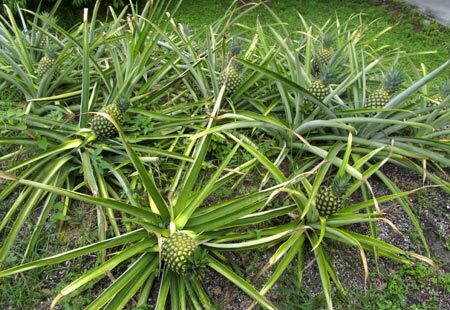 In the west bed, all the plants were two years old, fully grown from green tops cut off pineapples, and they were loaded with fruit. Each plant produces only one fruit, which grows on a stalk at the center of the plant. The fruit were very large, and the ripest ones were peeking out golden through long leaves. 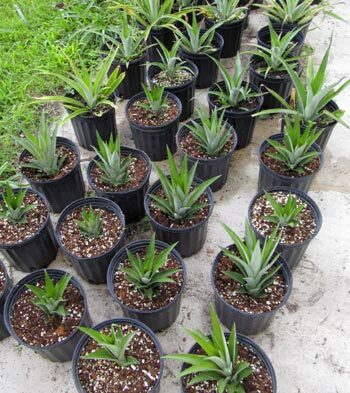 In the east bed were plants bearing slightly smaller pineapples, which looked like they would be ready in about a month or so. Those plants were a year old, originally hapas (or slips) that sprouted from the bases of the older plants. Last summer Tim had snapped off hapas and planted them in their own patch. Each mature plant sprouted one or two hapas. Plants grown from hapas bear fruit in one year, but plants grown from tops bear in two. More hapas potted up. These will be transplanted to a raised bed. Tim let us pick our own fruit. He pointed out the ripest ones, and told us what to do. Picking a pineapple is fairly simple. Grasp it firmly with both hands, give the fruit a snap to one side and a small twist, and it easily breaks off the stalk. I was once again surprised by how heavy and substantial it was. After picking, Tim aimed a hose at the base of the fruit and washed off a bunch of ants. They are attracted to sugar in the fruit, which start to ripen from the bottom. The pineapples we picked were amazingly heavy. Out came the scale to check weight. One was eight and a half pounds and the other was nine. (I haven’t weighed the ones you can get at the store, but they’re about half the size and weight.) Must be the special soil mix and organic fertilizer that Tim feeds his plants! The ripest fruit was ready to eat, and its sweet aroma tantalized us on light breeze, as we chatted on the back patio. 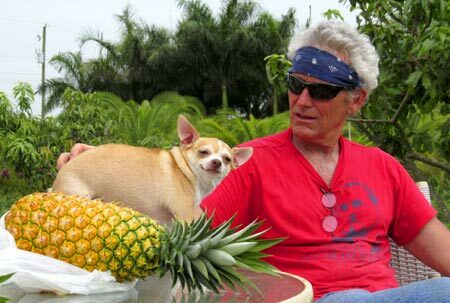 Tim’s feisty Chihuahua jumped from his lap onto the table and sniffed at the fruit, which easily dwarfed her. 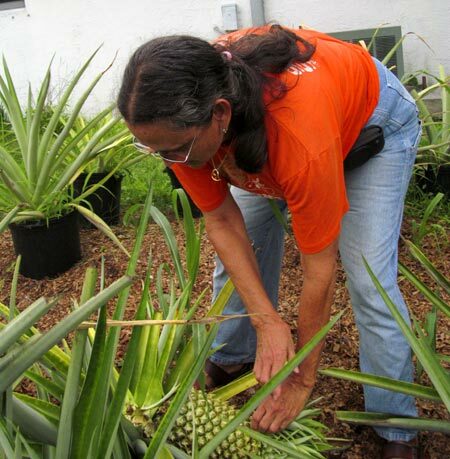 It can truly be said that on that small farm located at the edge of the Everglades, pineapples grow as big as a dog. Tim’s chihuahua is dwarfed by a giant pineapple.